Today I have been back in my workshop and it felt good. It’s long time since I was able to be there for more than a couple of minutes just popping in and out. I do love my little space and I know how very lucky I am to have it. I looked for a long while before I came upon it, it was fairly easy around this area at that time to find big cold draughty falling apart barns if that was what you wanted. Not so easy to find a comfortable place to work that was affordable and within relatively easy travelling distance and if it’s not going to be somewhere that you enjoy being in then you’re not going to want to go there everyday. WASPS are just converting some buildings in Kirkcudbright into studio spaces, that’s about 6 miles from here and though I do think it will be great to have more good spaces available around the region for artists and craftspeople to work in it does seem to be an awful lot in one small town, 16 or 17 I think. Anyway as I say it is hard to find somewhere good and walking down the way today (cycling is still off for a while, unless I get a huge rear view mirror maybe) I was excited to be heading back into my space after about three and a half weeks I think it’s been. It was a good feeling. 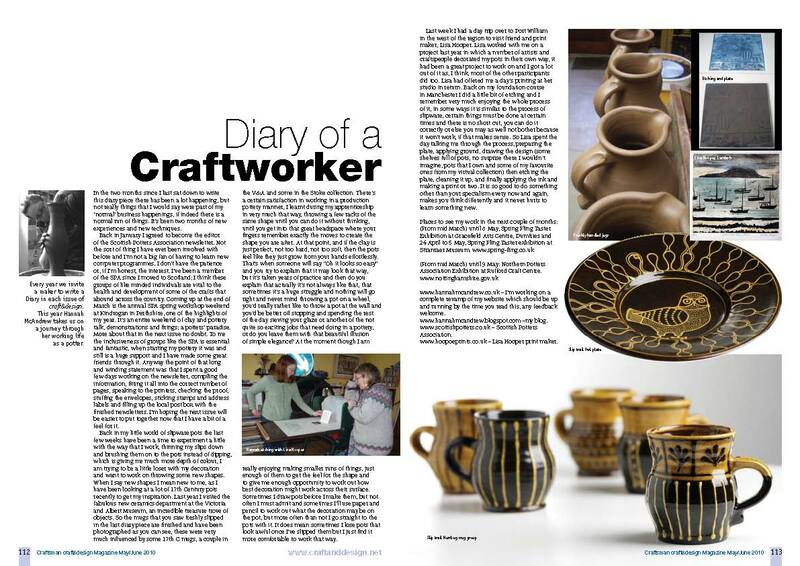 The article above is from May / June of Craft&Design Magazine, the new issue for July / August is out in a reputable newsagents near you now. Although I have been at work I have not been potting. I’m trying to be careful and not run before I can walk. I spent the day sort of pottering around, tidying up from the Germany trip as the slip covered boxes and buckets and pots were all still sitting unloved in my workshop. I slowly sorted them all out and put the place almost back to rights, packed a half dozen pots to go down to London and then walked home again just before a torrent of wet stuff came out of the sky. We haven’t had a good proper rain here for weeks and weeks. The place is so incredibly dry and lets face it we’re just not used to that here. I love that smell when you get a good rain after a long dry spell, very evocative. Right now it’s pouring down, blowing a hooie and feeling rather chilly. During last week as I was mooching around the house trying not to annoy Paul too much as he was trying to work I came upon a box of photos from my time working with Jason. It gives you an idea how long ago that is when I say box of photos, physical things of the sort that you used to take and then have to get developed. It’s an enormous change in the way we do things isn’t it. I’ve always taken lots and lots of photographs, I have albums full of the things documenting all sorts of weird and wonderful and down right dull and boring events. Anyway when I found them I thought (rather needing mundane jobs to keep me occupied) that I would scan and file them digitally as I’d got to send some somewhere just now anyway so I could kill two birds with one stone. So the two bowls at the top there, slip trailed cereal bowls, they are from the very first batch of pots I made at Jason’s pottery which would have been October 2001. 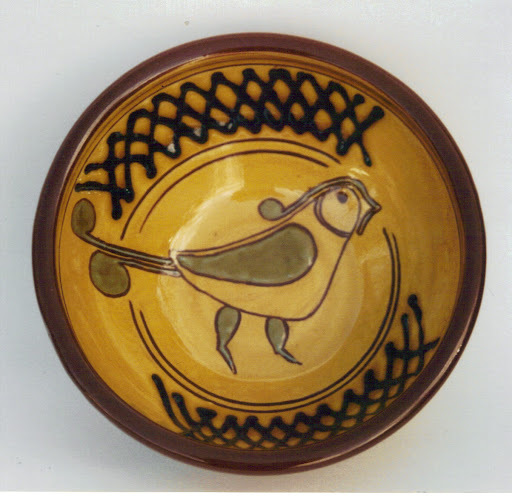 I think the bird and defiantly the two sgraffito ones are from that same batch of pots too. I had never decorated any pots in my life until that point, I was scared out of my wits about the idea at the time. I moved up here to take up a place with Jason as his apprentice, gave up a job and my flat etc etc and moved 200 or so miles to a place where I knew no-one other than my mum and dad and had met Jason once for about half an hour or so, the chap I was going to spend the next twelve months working with which turned into more like two years in the end. For me at that time it was a hell of a thing to do, a huge decision though I knew I had to grab the opportunity and a massive change in my life. Now I know it was in fact the best thing I ever did, then it felt like utter madness. Many people told me just that back in the place and job I was leaving behind, I lost a lot as a result but in the long run I gained so much more and learned things I would never have done if I had stayed where I was and looking back I just had to do it. I could only feasibly take up the place because I could move in with my mum and dad, they’d upped sticks and shifted about a year earlier. Apples and bread was the starting wage, home grown apples and bread baked in Jason’s wood fueled oven. So suddenly here I was in very rural south west Scotland after a flat in a densely populated, big town in north west England. For the last year at uni I’d made stoneware pots, I’d been looking at lots of Eastern pottery, lots of wood fired anagama type pots and functional stoneware that Alex McErlain used to show us at uni which was from his time at Winchcombe. All of these things were for the most part un-decorated, maybe a splash of glaze or oxide. I do remember fiddling with some sgraffito for a little while at uni, there must be some pictures of that somewhere now I come to think about it. So going to Jason’s was a bit of a departure. I knew I wanted to make pots but at that point I still hadn’t found my “thing”. So it’s down to Alex that I make pots, thank you Alex! 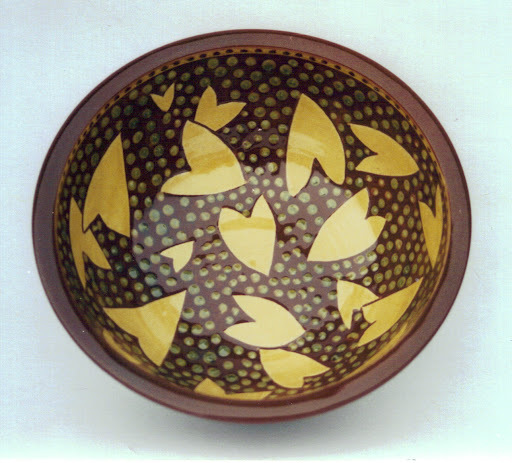 And then it’s done to Jason that I make slipware, thank you Jason! What a pair of fantastic men, I don’t think they have ever met each other but they both introduced me to things which have in no small way shaped my life. 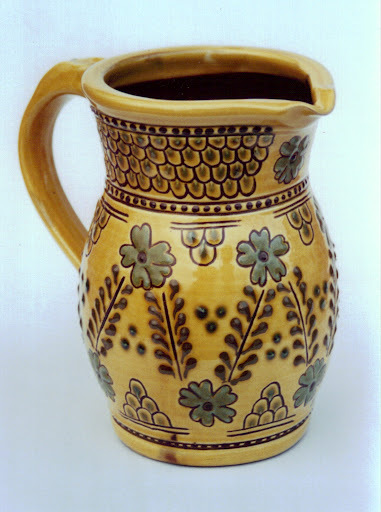 These jugs, they look a bit odd looking back on them but I am very fond of them. I wonder where they are now? This sgraffito and slip trail jug would have been towards the end of 2001 or spring 2002 I think. I made loads of jugs, all different sizes. Jason would show me a shape and then I’d make it and make it and make it until I could get it right and then I’d make some more. 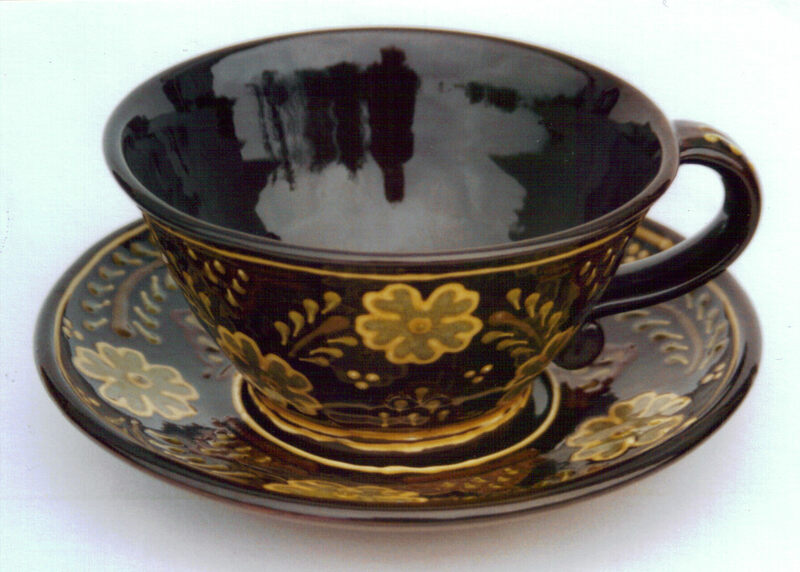 This is a biggish cup and saucer, about 12 or 14cm wide, I made some tiny wee ones too, dainty little hold your little finger out while you drink sort of size and all around spring to summer 2002 I would guess. Lots of plates too, we were using Fremington clay which was on the one hand beautiful, lovely colour, very smooth, makes a lovely glaze, on the other hand horribly annoying especially for plates as it would ‘S’ crack all the flipping time. It was a bugger for that. But we made lots of plates. 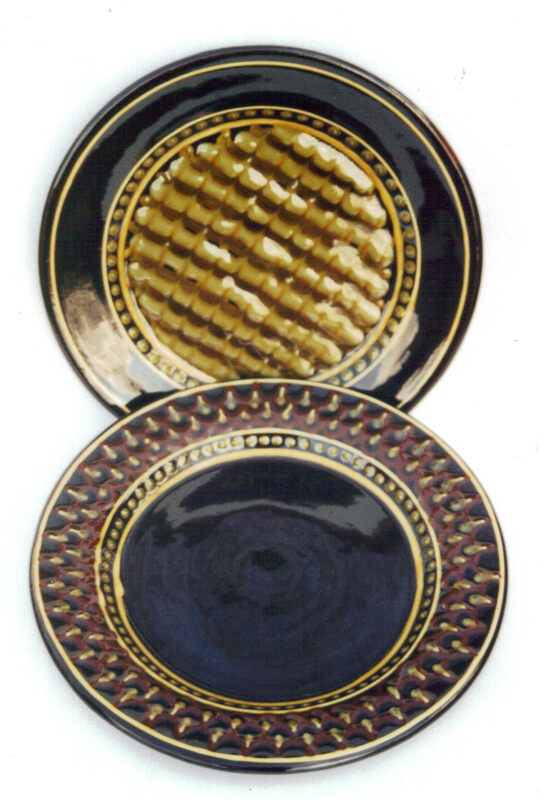 Jason was making a lot of commemorative plates at the time both in the slipware and the majolica. I’ll show you some of my poor attempts at painting majolica another time maybe. Most of these pots would have come through the electric kiln there. Jason’s work is all wood fired but as I was right at the beginning of learning he wanted me to see the results as soon as possible so that I could see how things worked or didn’t work and his wood fired kiln is a bit of a beast and now working on his own it takes him a year of making to fill it so I wouldn’t have seen things for ages and ages after I’d made them. We would mix the Fremington clay with silica sand to make it suitable for making oven dishes with. Ah that was so not my favourite job, standing in one of the barns sieving sand, I will never forgive the man for making me do that, I hated that job and I have told him so on no small number of occaisions. He always laughs. 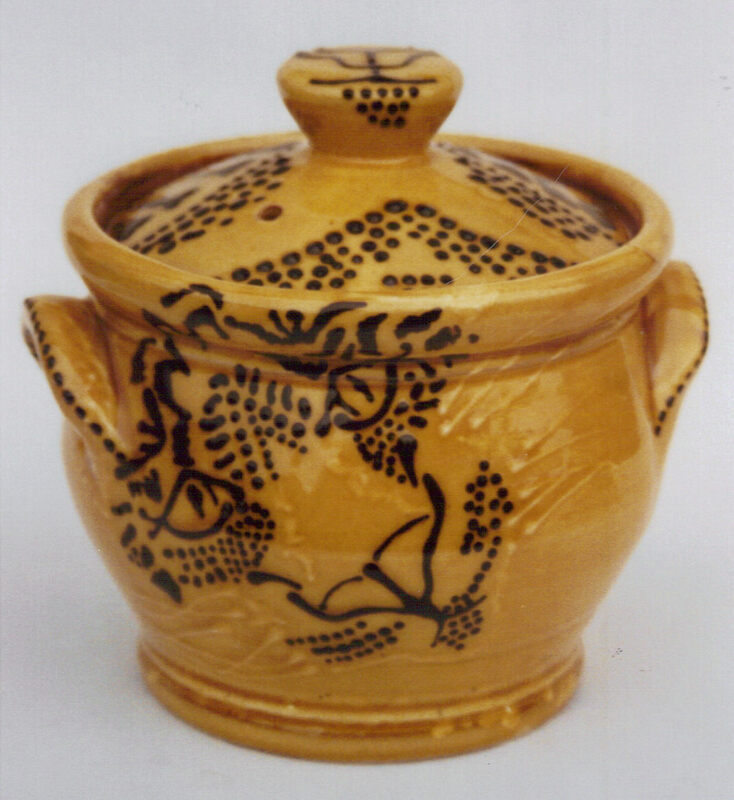 Anyway one time we mixed and pugged a huge batch of oven clay and I made dozens and dozens of these lidded casseroles, this was the smallest size, it’s about 14cm high. 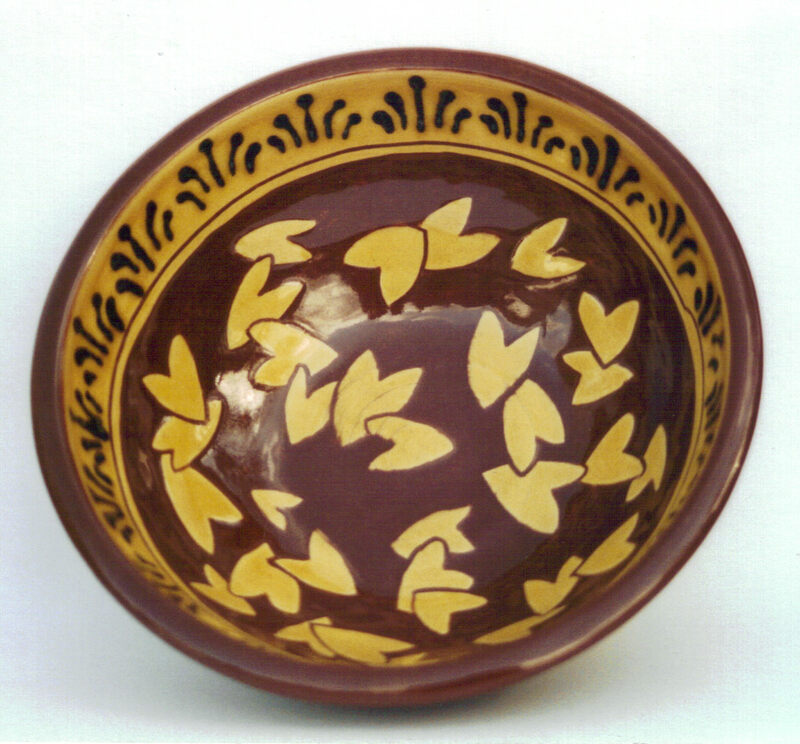 They were a lovely fat pleasing shape, there was a sgraffito elephant one too. Things that I wouldn’t do at all now, not in such a trying to make it realistic way anyway. I must do some more of the white trailing on the white slip, I did a couple of big fat mugs earlier in the year with it, I thought it had potential and there’s three jugs sitting on the shelf at work waiting for firing I noticed today and the whiskers on the big cat are reminding me again. Well I hope that scratches the itch of needing to see some pots for some of you. It’s good to revisit every now and again. 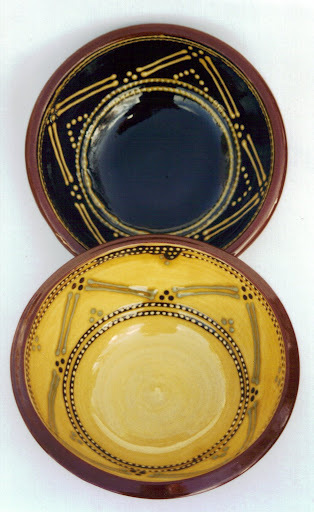 Maybe I’ll look out some college pots for you next though they might frighten you as some where so very awful, or maybe some from the early days of me working on my own or some more of the sgraffito and majolica from Jason’s. How about you choose? Let me know which you’d prefer and I’ll do my best to oblige as it may be a while longer till there’s any new ones through from me. 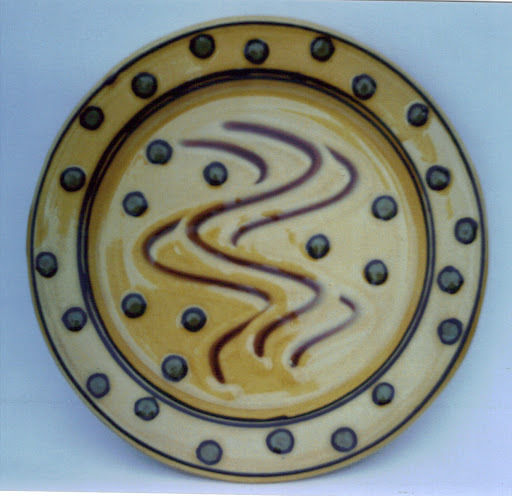 This entry was posted in casserole dish, Craft and Design Magazine, cups and saucers, Fremington clay, Jason Shackleton, jugs, majolica, plates, slip trailing, slipware. Bookmark the permalink. Hannah these are all so great to see. Lucky you to have had such good teachers. I'd like to see that majolica. It's probably good if I know you. Thanks for the 'encouragement' this morning. Ha, my poor color pots. I think I need to give it up. Sgraffito and majolica from the Jason era would b good. Good & interesting llllllooooonnnnnggggggggggg post.Hopefully u will continue to improve & will be in a position to either play for or manage England soon – don't u know!! Wonderful post, having just "met" you I enjoyed seeing some of your beginning. I loved the older pots as well. That cat was great, though as you say so different then your stuff now. Keep healing! I'd love to see some of your majolica. The photos you posted here are wonderful. Though this is not the kind of work you are doing now your 'hand' shows up in these clearly–very lovely!